The size of our large country and our small numbers mean that chances to get together in larger groups are highly valued. We invite old and new Friends, and those who seek, to contact us and experience the events described below. For registration information for upcoming gatherings and events, see our site’s News section. Western Half-Yearly Meeting (WHYM) meets twice a year: May in Sorrento, B.C. and October on the Prairies. The Fall meeting on the Thanksgiving weekend alternates between sites in Saskatchewan and Alberta but on the Spring long weekend it is always at the Sorrento Centre. Friends from Ontario to Vancouver Island to the North and everywhere between travel to WHYM to gather for fellowship and worship. WHYM is an intergenerational community with programs for everyone; folks attend from every age group, including young children, teens, and elders. All the treasured WHYM traditions of balancing, singing, campfires by the lake, rides on the “Flying Fox” zip line, Worship Fellowship, Special Interests, and Meetings for Worship and Business provide the context for us to learn, make new friends, and renew our bonds with one another. Quakers in the Atlantic provinces gather on the long May weekend every year for spiritual nurture and fellowship at a rustic seashore centre during Atlantic Friends Gathering (AFG). The gathering now includes a Meeting for Business, as the newly-constituted Atlantic Half-Yearly Meeting. It still includes a planned program, lots of outdoor time, spiritual discussion and reflection, and fun activities. Children from 0 to 100 are welcome! Atlantic Quakers meet again for one day in the fall to conduct a Meeting for Business, coordinate their activities, and exchange information among Meetings. For more information please email afg-contact@atlantic.quaker.ca. Quakers from the Hamilton, Toronto, and Yonge Street Monthly Meetings meet twice a year at Yonge Street Half-Yearly Meeting (YSHYM). These gatherings combine worship, a short program, and a business meeting with the fellowship and enjoyment of one another’s company that bind us joyfully together. The Spring gathering, held at Camp NeeKauNis over the first full weekend of June, includes a Friday evening program led by the YSHYM Continuing Meeting of Ministry and Counsel. The three constituent monthly meetings plan and facilitate the Adult Program, the Youth Program, and meal preparation. The Fall gathering, held in late October or early November, is planned and hosted by one of the three constituent monthly meetings in turn. The YSHYM Coordinating Committee oversees both gatherings, reviews the role of each monthly meeting, and offers resources, guidance, and assistance. The Coordinating Committee consists of representatives from the three constituent monthly meetings plus a member of YSHYM Continuing Meeting of Ministry and Counsel, and the YSHYM Clerks and Treasurer (ex officio). The Monthly Meeting representatives serve as liaisons for their monthly meetings. If you live in the Greater Toronto and Hamilton Area, here is a wider Quaker fellowship that you and your family will enjoy. For more information, please email yonge-street-hym@quaker.ca. Pelham Half-Yearly Meeting is based in the Niagara area, and also meets twice a year, spring and fall. It is intermediate between its constituent Monthly Meetings and Canadian Yearly Meeting. Its primary purpose is to foster the spiritual growth of its four constituent Meetings: Pelham Executive Meeting (St. Catherines), Yarmouth (Sparta), Coldstream, and Kitchener Area Monthly Meetings. It provides Friends separated by several hours of driving time the ability to come together for worship and fellowship. As an intermediate Meeting, PHYM receives annual State of Society Reports for consideration before they are sent on to CYM, receives Memorial Minutes of Friends under its care and takes on other business as guided, such as supporting concerns of individuals or Meetings. The daylong gatherings include worship and business in the morning; a leisurely potluck lunch allowing plenty of time to renew friendships; and an afternoon program, designed and led by each Monthly Meeting in turn. PHYM’s roots go back to the beginning of Quakerism in Canada. Three of its four constituent Monthly Meetings have the deepest roots of any in Canada. Pelham Executive Meeting, the oldest, was founded in 1799; Yarmouth, located in Sparta, was formed in 1823; and Coldstream in 1837. 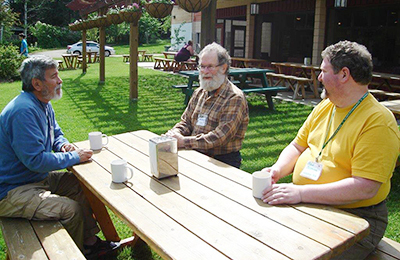 Although most Canadian Quakers are Convinced Friends who have found their way to Quakerism after much seeking, these meetings have members whose connection to the Society of Friends goes back many generations — a great asset in the spiritual life of the Half-Yearly Meeting, and indeed the Yearly Meeting. The fourth Monthly Meeting, Kitchener Area — including worship groups in Guelph and Lucknow — was formed in 1967. For information, contact the Pelham Clerk. St. Lawrence Regional Gathering has five participating Meetings: Ottawa, Montreal, Peterborough, Wooler, Thousand Islands, and their nearby Worship Groups. Its gatherings are held in the spring, and fall (usually the weekend after Thanksgiving), at a location central for the five Meetings. Organization is rotated and information is available through Montreal Monthly Meeting. West Lake Quarterly Meeting joins the same five Monthly Meetings and may be contacted through its Clerk. For more information on St. Lawrence Regional Gathering, contact the St. Laurence Regional Gathering Clerk. 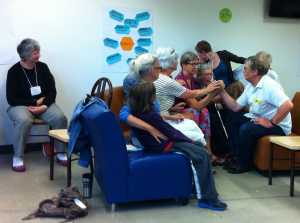 Canadian Yearly Meeting (CYM) is a gathering once a year for all Canadian Quakers. Its Business Meetings are the main decision-making body of Quakers in Canada. There’s also lots of time for fun and games, and sessions focusing on spiritual development, social justice, and Quaker history. In 2019, Yearly Meeting will be held August 2-10, at Canadian Mennonite University, in Winnipeg, Manitoba.